Terez A. Paylor of the Kansas City Star reported on Thursday that fifth-year pro Tyler Bray has opened the offseason as the No. 2 quarterback for the Chiefs, currently ahead of 10th overall draft pick Patrick Mahomes. While Bray, undrafted in 2013, has never appeared in a regular-season game, he has beaten out a pair of fifth-round picks in Kevin Hogan (2016) and Aaron Murray (2014) during his tenure in Kansas City. 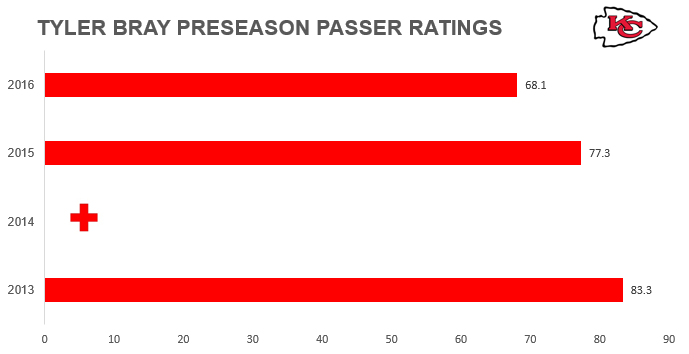 In 185 preseason snaps for the Chiefs, Bray has struggled a bit, with adjusted completion percentages of 68.0 (56th) in 2016, 71.0 (54th) in 2015, and 74.3 (33rd) in 2013. He missed the 2014 season with an injury. Current Chiefs starter Alex Smith has missed two starts due to injury during his time in Kansas City.